You may not know this but your windows collect dirt from everything happening around them, on the outside as well as on the inside. Vehicle emissions, wind, rain, snow, cigarette smoke, cooking, dust, fingerprints – they all add to the layers of dirt on your windows from both sides. But you only notice them when there are a lot of layers and it can be visible from afar how dirty they are. Our company is located and operates in Notting Hill W11 and we are offering you to try our professional window cleaners. 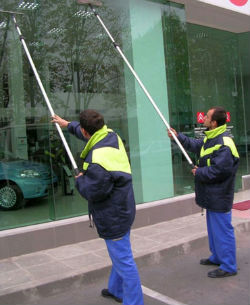 With us you will notice the difference between your window cleaning and our window cleaning. Plus sparkling clean windows always make a good impression on people. We have only the most experienced and vetted professional cleaners working for us. You will not regret choosing us, because we have the most amazing window cleaners in Notting Hill, call us and we will prove it to you. Our cleaners always go to our clients well equipped and prepared. They are trained to work with every kind of special machinery and tool, they are very skilled at different methods of window cleaning. They know how to clean them perfectly and not leave any traces of droplets or streaks. Trust us and we promise to give you shining windows that will last longer than usual. Please, give us a call right away and find out more about our packages, prices and choose the best one for you. With us you can sit back, not worry about anything and enjoy the results of our impeccable window cleaning service. We are a certified and renowned company that takes pride in its fantastic window cleaners, because the are best ones in Notting Hill W11. Contact us for an appointment now.